The website Google Finance was updated in a complete makeover in Q1 of 2018, and the update was absolutely terrible! And ever since Google discontinued the Google Finance mobile App, which was devastating because it was such a quick way to view stocks. , the update to the website is the final nail in the coffin for me as I have fully migrated to using Yahoo Finance as my daily stock tracking app and website. To be honest, it did take me awhile to break the habit of going to finance.google.com, but it only took about a week before I was use to visiting finance.yahoo.com. 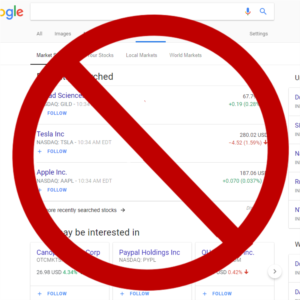 In my opinion, the goal of the changes was to unify Google Finance into their main Google Search page as a separate tab (like many other categories like News, Images, Shopping, etc). Therefore, the sub-portal that once was finance.google.com no longer exists and redirects to their main page. And I understand how this is convenient from big picture perspective, but the reality is that many of the other useful features of the classic Google Finance site got lost in the transition. Nowhere to be found is the Stock Portfolio feature. And though I only used it as a list to conveniently scan a list of similar stocks and not the full feature portfolio of tracking price gains and loses, it was still a simplistic way of quickly tracking stocks. i.e. one portfolio for tech stocks and a second portfolio for biotech stocks. Whenever I had add extra funds to a stock brokerage and in search of a new position to open, I would often times start by evaluating simple company fundamentals with Google Finance's Stock Screener. This feature is also nowhere to be found, though there is a chance it may be re-introduced in the future. If I were to ignore the missing features, I still have many gripes with the new layout. The Google Finance page is no longer information dense. The new charts also doesn't attempt too overlay news. To be fair, this was a feature did not appear to be maintained, but now the chart is just looks basic with a fancy skin. Any mention of news falls below the fold on my laptop. Instead, they show me other stock I may be interested in following. Considering what I do on the page 95% of the time when I visit a particular stock, it's to see the price, meta-data, or news on the stock. Meanwhile, the entire right column of the page is completely empty. Why not put new stock ideas or news information there so I can view it side by side with my chart? Yahoo Finance is by no means perfect, but does take it one step closer to replacing the features that Google no longer offers. Yahoo Finance Android App: I can finally use an app on my Android phone again instead of mobile friendly browsers. Yahoo Finance has large fonts with the most critical information presented at the front page. What more can I ask for? There are time on first load where the numbers don't refresh, but that's hopefully a bug that Yahoo can eventually fix. Stock Screener: Google has also managed to get rid of this feature. Though this wasn't a feature I used all the time, it was certainly a powerful tool for discovering new tools based on different factors. But this feature is also covered by Yahoo Finance, and in a better implementation, as they allow you to save your screener parameters for easy future use. Of course, Yahoo Finance wasn't the only alternative financial website/app that I tried before settling on Yahoo Finance. There have been a few other services that I tried that for one reason or another I didn't really like. SeekingAlpha: When still using Google Finance, I very much enjoyed the in-depth analysis of stocks on articles at SeekingAlpha. Unfortunately, they lack in the department of actual stock tracking. In my opinion, their stock profile list was too small and difficult to use. To wrap up, just imagine what a disaster it would be if Google tried pulling this same exercise by integrating YouTube in with the main Google Search bar? Sure you could locate a YouTube video, but all the ancillary feature would become difficult to navigate to. I'm don't really understand the difference in having a unified vs portal version of Google Finance, but the least they could do is bring back critical features like Portfolios and Stock Screeners.